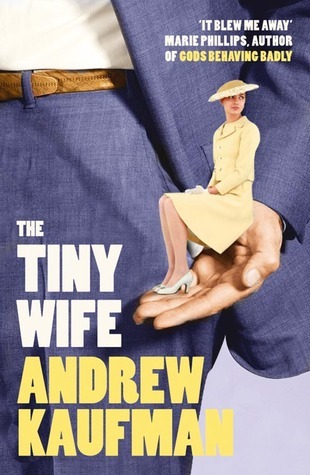 The Tiny wife is one of the shortest books I’ve ever read, and one of the strangest. 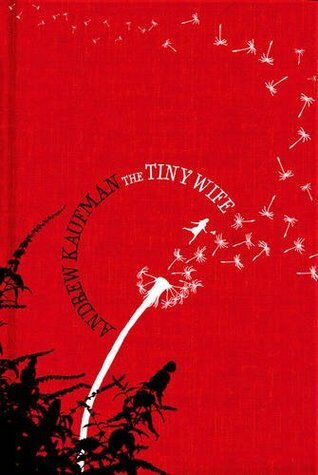 This book was recommended to me, and as I have been wanting to read something by Andrew Kaufman for a while, I thought I would start with this novella. 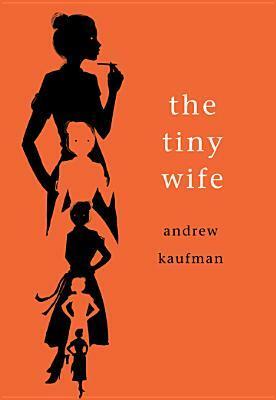 The Tiny Wife is described as a “modern fable” on Goodreads, and as “Charmingly wonky” on the back of the book. It’s full of the fantastical, which is not normally my thing, but it held my interest, made me think, and made me laugh. It really did make me think; I spent the whole book trying to figure out why what was happening was happening. I’m still not sure I’ve entirely figured it out. The robbery was not without consequences. The consequences were the point of the robbery. It was never about money. It has come to my attention that the vast majority of you, if you even believe you have a soul, believe it sits inside you like a brick of gold. But I am here to tell you that nothing could be further from the truth. When I leave here I will be taking 51% of your souls with me. This will have strange and bizarre consequences in your lives. But more importantly, and I mean this quite literally, learn how to grow them back or you will die. The rest of the book tells of the strange and implausible tales of the unfortunate victims of the bank robbery; a man gets his heart pulled out of his chest by his ex; a woman discovers she is made completely out of candy and her husband eats her up; a woman’s husband turns into a snowman and she stashes him in the freezer; another woman’s lion tattoo leaps off her ankle and chases her. The story is narrated by the husband of one of the victims. His narration gives us an interesting perspective on the story, being one step removed from the action. He seems almost unconcerned by the crazy things that are going on. Understandably, he is concerned about his strained marriage, but he doesn’t seem too panicky about the fact that his wife is shrinking. A lot. She’s shrinking more and more everyday. But, what can they do about it? I am not going to analyze the book, or tell you what I think it all means, beyond saying that it has to do with looking more closely at ourselves and what is important to us. Partly because I am afraid I don’t really know the answers, but also because it might mean something different to everyone. But, if anyone reads it, or has read it, please let me know what you think in the comments. The thing I appreciate most about this book is how imaginative it is. I found myself laughing out loud over the outlandishness of the stories. I definitely plan to read more from Andrew Kaufman, just to see what else he’s come up with. His other books are All My Friends are Superheroes, The Waterproof Bible, and Born Weird. Good titles. For more details and insights into the meaning of the book, read this review at Bella’s Bookshelves. I liked the book, but I think she loved it. Hmm, this doesn’t sound like my kind of book, but sometimes you can’t tell. It wouldn’t usually be my kind of book, either, but it was actually a fun read. And, I’m definitely curious now about his other, longer books. It certainly sounds different, which can be nice. Thanks for linking to my review, Naomi! Good, I’m glad I got that right! 🙂 Have you read any of his other books? This actually sounds like a delightful little book! If the book was longer I wonder if people still would get through the whole thing? I recently read Neil Gaiman’s The Ocean at the End of the Lane which was totally an adult fairytale as well – I wonder if there is an adult appetite for fantastical stories? I definitely think the book could have been longer. The premise of the book is such a cool idea with lots of room for further exploration. The short length of it, and the quick way it wraps up, makes it feel even more like a fable though, which is maybe what the author was going for. Maybe we miss the fairy tales of our youth? I like the sound of this, though admittedly I tried to read his All My Friends are Superheroes and didnt get very far: it felt a bit juvenile to me. This one is fantastical, but I wouldn’t call it juvenile (in my opinion, anyway), so maybe you would like it better. Good to have an opinion on one of his other books! Isn’t it funny how some of the comments are a bit nervous about the fairy tale like format… I have the same instinct! I recently started Kirsty Logan’s The Rental Heart which is a bit surreal fairytale and although it made me think, I also found it a bit hard work. Maybe we are scared that fairytale being less than real can be distancing? Yes, I often feel hesitant when I hear that something has magical realism in it, but then when I have tried it, I have enjoyed it. I think it can work well if it’s well done, and it’s nice sometimes to slip into a world where anything can happen. In this case, the reading is not at all hard work- it is quite enjoyable! Great recommend. I will have to check it out. This book seems like one you would like, though. If nothing else, it might give you some inspiration! Not sure I need more inspiration. But it sounds like a great read. Although it sounds a bit out there, I’m interested in this book and would give it a go since it’s super short. Hopefully I actually understand what’s going on. You should! And then tell me what you think! It’s a fun read, even if you don’t completely get it. Naomi! I just read this book and it’s incredible. I think I may have also been a little confused if I hadn’t read All My Friends are Super Heroes. It, too, is a bit odd, but I loved it just the same. I’m not sure how he’s able to say so much about the importance of love and respect in a marriage and in life when he’s busy writing about incredible and unbelievable circumstances, but he seems to get the point across. A friend of mine just gave me Born Weird. I can’t wait to read it. So glad you liked it! And, you’ve reminded me that I still want to read his other books. Let me know what you think of Born Weird once you’re done!